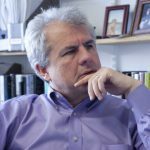 This blog was written by Professor Lant Pritchett, Professor of the Practice of International Development at the Kennedy School of Government at Harvard University, USA, and RISE Research Director at the Blavatnik School of Government, University of Oxford. This blog was originally published on the Effective States and Inclusive Development Research Centre website on 7th March 2019. Expert on education and development, Professor Lant Pritchett reflects on what he thinks are three highlights of the new open access Effective States and Inclusive Development (ESID) Research Centre book, edited by Professor Sam Hickey and Naomi Hossain: The Politics of Education in Developing Countries: From Schooling to Learning. First, it acknowledges and emphasises that the politics of schooling (expanding access to more years of schooling to more of the population) and the politics of learning are not, and cannot be, the same. The reason we must have very different models for the politics of schooling and the politics of learning is simple: the primary empirical facts to be explained are completely different. The main fact to be explained with a politics of schooling is why nearly all countries have managed to achieve such a massive expansion. The average years of schooling of adults in developing countries has increased by five years (from about two years to about seven years completed on average) and this expansion has happened nearly everywhere and pretty uniformly across major political ‘types’ of country. 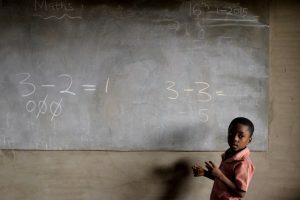 Schooling has increased by about five years in democracies and non-democracies, in countries with good and bad human rights records and in countries with high and low corruption. The puzzle is why this expansion of schooling is so ubiquitously large across countries. The puzzle for the extent of learning a child receives in a typical year of basic schooling is exactly the opposite. An analysis of the Demographic and Health Survey data about the proportion of women who can read a sentence shows that the fraction of women who completed grade 6 who can read a single simple sentence varies from essentially zero (e.g. 7.6 percent in Ghana, 11.9 percent in Nigeria) to essentially 100 percent (e.g. 80 percent in Kenya, 88 percent in Tanzania). Similarly, even among developing countries, the results on international assessments of the learned competencies of 15-year-olds in school like PISA (and PISA-D) vary from countries like Vietnam, which achieves around 500 (the same level as OECD countries), to its neighbour, Cambodia, which scores only 325 ( implying that the 95th percentile Cambodian student doesn’t reach the Vietnamese average) – or even lower, like Zambia at 281. 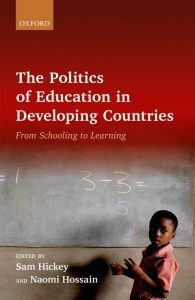 The first virtue of this book is that it tackles head-on what is bound to be a hard question: why have so many developing countries had a politics of schooling without a politics of learning? Desmond Yeboah (6), grappling with a maths problem at the Finger of God Preparatory School in Madina, a suburb of Ghana’s capital. The second positive feature of this book is that it adopts a ‘policy domains’ approach that searches for the political and policy determinants of the proximate determinants of learning. Many approaches to explaining low levels of learning start and stop with the proximate determinants. So, suppose we know that in order for a child to learn they must have sufficient time on task with exposure to an adequate teacher. Then we might be able to use data to look at why children are not getting adequate time (e.g. student absenteeism, teacher absence from classroom, poor classroom time management, too many subjects, leading to low time on task to each) and to data on the fraction of teachers who know the material and know how to teach (and Bold et al. 2017 do an excellent job of this across several African countries). But this decomposition of performance into lists of differences on observed proximate determinants is going to have two limitations. First, due to variations in capacity, the effects of policy and politics lead to big differences in outcomes, even for the same observed inputs (see the example of across South African provinces). Second, and more importantly, the explanation of performance in terms of proximate determinants begs the crucial question of how those differences in proximate determinants emerged and persisted and what can be done to fix them. There is a tendency towards a technocratically enabled political and policy making naiveté in which, if it is demonstrated that student learning is low because of high teacher absence from the classroom, the recommendation is to raise teacher attendance. But this assumes that teacher attendance is not itself an outcome of the operation of a given education system under a set of political and policy determinants. The policy domain analysis in the book allows for an understanding of the wider determinants of the proximate determinants of learning, which is essential for improving outcomes. Merely naming a problem is not naming its solution. Third, the book adopts a political settlements approach to the politics of learning, which allows that very different ‘types’ of government and governmentality exist and that the way to improved outcomes might vary across those types. All too often, the ‘politics of X’ is taken to mean ‘the politics of X in a (a) competitive electoral democracy with (b) institutionalised political parties, (c) strong rule of law and (d) capable Weberian bureaucracies’. Hence the default model of the ‘politics of X’ is the politics of X in Sweden or Canada and then one might try and think about how the ‘politics of X in Indonesia under Soeharto’ differed from that default in a variety of ways. This book, following the political settlements approach, starts from the premise that there are analytically very different types of politics and modes in which public administration works and that these are not well understood as deviations from democracy or rule of law, but rather have their own logics. This is a promising approach and the six case studies provide a valuable first cut exploration in the domain of education. This is not to say this book ends the exploration, but it does shines the light down a promising path. Download or order a copy of the book.